PRIME, CHOICE, SELECT — WHAT’S THE DIFFERENCE? The USDA has created a beef grading system that is based almost entirely on the amount of fat marbling the meat contains. 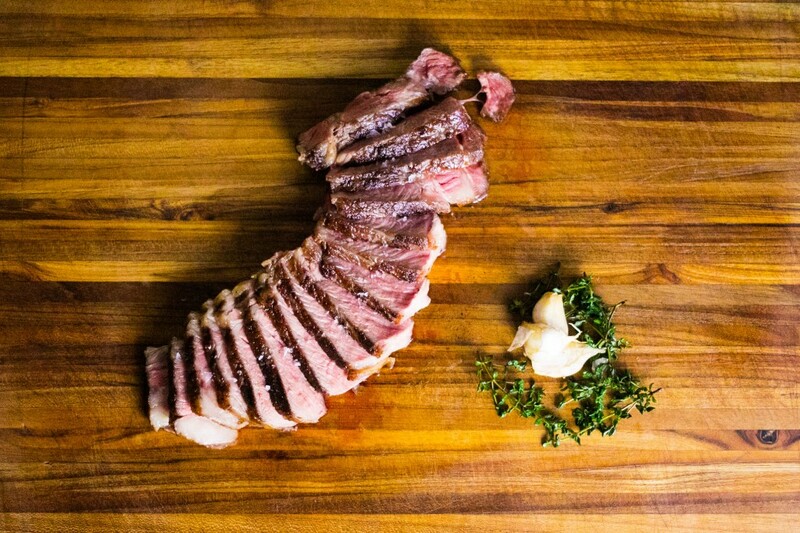 Marbling is, well, just that — nice veins of fat snaking their way throughout the meat. When heated, this fat melts and spills delicious flavors and juiciness into the surrounding flesh, creating the deep flavor and unctuous mouthfeel that most of us have come to crave. PRIME contains the highest fat marbling, CHOICE has less, and SELECT is the leanest. Pricing will follow in the same order. When at the meat counter, if you can afford it, pick out the most marbled piece of your favorite cut, and you will be happier for the few extra bucks spent! The best steaks are tender cuts from the animal’s midsection. Like us humans, the back, stomach and rib areas are the least hard-working, and therefore the tenderest cuts of meat to be used for steaks and chops. Shoulder and leg meats support these great beasts, and therefore contain more connective tissue to break down. Those cuts are more appropriate for braising and slow roasting as they are too tough for the relatively quick cooking of a steak. Of all the cuts in the cow’s midsection, the short loin is where you’ll find the often prized and extremely lean beef tenderloin. When butchered into steak, it is known as Filet Mignon — a very tender piece of meat that in my opinion, seems to lack flavor, cooks too quickly and can tend to dry out. As you move forward from the rear to the front of the animal, you’ll encounter the Porterhouse, a bone-in cut that contains a New York strip steak on one side and a tenderloin (filet) on the other. The T-bone comes next, similar to the porterhouse, but with less of a filet, and more marbling as you move up toward the primal rib area of the cow. This is where you’ll find one of my favorite cuts, the ribeye. The ribeye steak is cut from a standing rib roast (otherwise known as “prime rib”). It has lots of rich marbling and a very distinct sweet flavor. A few of my other go-to steaks are skirt and flank, which are cut from the abdominal muscles of the cow. They are slightly on the lean side, take marinades well due to their naturally flat shape, and have great flavor and texture. Flank and skirt cook quickly and are the most common cuts used in Latin countries, perfect for street tacos or Barbacoa. It’s super important to follow the “slice against the grain” rule for maximum tenderness with these cuts. That’s pretty easy though, as their thick muscle fibers are super visible. DRY AGED VS. WET AGED? The aging of meat has been done for centuries and is a common practice in the meat industry of the western world. During the aging process, which can vary in length depending on whether the meat is dry or wet aged, naturally occurring enzymes begin breaking down muscle fibers and aid in the development of flavor and tenderness. Modern butchery methods and the USDA tightly regulate aging practices by the use and regular inspection of climate controlled refrigerators to keep the meat safe while it ages. Wet aging is the most common method of preparing meat for the market, and is what we are consuming when we buy that vacuum sealed or plastic wrapped cut of meat in the grocery store. This method is the most cost effective because it ages in its own juices and does not lose any weight due to evaporation. This process is also much quicker, often just a few days to a couple of weeks, which is why large meat companies prefer to wet age. Dry aging, on the other hand, is often associated with expensive steakhouses and gourmet chefs. That is because dry aging can take much longer while the moisture slowly evaporates, shrinking the steak but also concentrating the flavor as the enzymes do their work on the tenderizing. Usually, the outer layer of dried meat is trimmed before using. It’s easy to see why the price is so high, as between water weight loss and trimming, a piece of meat will lose a lot of its original weight. Opinions vary, but I think the best dry aged steak is between 1 and 2 months. The tenderness is unparallelled, and the nutty, beefy flavors start to come through but are not overpowering. Steaks dry aged 100 days or more may begin to get a “funky” blue cheese aroma, which for most, is an acquired taste, but for others, a sought after flavor profile. GRASS FED VS. GRAIN FED, ORGANIC OR??? These days, the need to buy organic, grass-fed and finished meat has never been greater. Some may see it as a high priced “trend”, but eating grass fed supports your health in more ways than you may realize. “GMO” brandied about in the news, in Whole Foods and our local organic markets. GMO, Genetically Modified Organism, is a laboratory technique of manipulating the genetic material of a crop to create better yields, and/or protect against a certain pest or disease. In the laboratory, scientists insert genetic material from most often a completely different organism (i.e. bacteria) to produce seeds with traits they are trying to achieve. This sounds smart on the surface, like a hyped-up hybridization technique (which it isn’t), and the fact that we are ingesting these substances should cause another level of alarm. If you aren’t eating organic, you are eating GMOs,4 and the animals you consume that are eating GMOs contain them in their meat, along with some other scary substances. One example is that GMO soybean, corn, and other grain crops grown for feed (and for human consumption) are bred for resistance to the herbicide RoundUp, which is sprayed on these crops to hasten maturation and create a more efficient harvest. One of RoundUp’s main ingredients is glyphosate, and its residue is ingested by cows on a daily basis. Add together that and the high level of antibiotics factory farmed cattle are prophylactically given to control infection in their crowded living conditions, and wow, look what has made its way onto our dinner tables. Both the antibiotics and the glyphosate decimate the microbiome in our guts, not only leading to inflammation and discomfort, but have also been linked to leaky gut syndrome, endocrine problems, and other autoimmune disorders.5,6,7,8 (It leads us to wonder if all of the gluten intolerance is just that, or if it is actually the glyphosate wreaking havoc on our GI tracts?!) So, in essence, eat organic, grass fed beef, period! Many home cooks and even professional chefs subscribe to the method of salting meat right before cooking. They fear that salting too early can pull out all the moisture, creating a dry end- product. Samin Nosrat discusses the science behind this in her amazing book Salt, Fat, Acid, Heat — https://www.saltfatacidheat.com. Salting a steak actually does initially pull out the moisture, but then, incredibly, that moisture is then absorbed back into the meat, resulting in the juiciest and tastiest steak imaginable. Salt is an ideal tenderizer as it denatures, or untangles, the proteins that when kept bound, can create a tough texture. Some feel that acidic marinades work well for this reason, but unfortunately, are usually left on too long (i.e. overnight) and give the meat a mushy texture. Try your acid based marinade for for only an hour or two next time and notice the difference. How Long Should I Pre-Salt? It takes about 30 minutes for a pre-salted steak to have all the moisture pulled out, and another 30 minutes to reabsorb — around an hour total. The size of the cut of meat will determine how long ahead you should salt it. A whole pig can benefit from 4 days while a Turkey needs just 2. Thick steaks (greater than 1”) and whole chickens should be salted a day ahead. If you do not have time to salt your steak at least an hour ahead of time, then season it right before cooking. If you try to rush things and cook the steak on that 30-minute mark after salting, the steak will not have reabsorbed its moisture, and you will end up with a very dry end-product. I recommend salting a day ahead and letting the exterior dry on an open rack in the fridge. This concept goes for poultry as well because you want that crispy skin. By drying the exterior in the fridge you are not drying out the meat, just making sure no moisture remains on the outside. Moisture is the enemy of crispness and caramelization. This method will give you a beautiful crust. If you don’t have time to “dry age” it overnight, just be sure to give it a good hour after salting, and pat off the excess moisture before cooking. Remove steak from refrigerator a good 30 minutes before cooking, to bring it closer to room temperature. This helps with even cooking and a juicier end-product. After removal from the refrigerator, season your meat liberally with salt and spices, or just pepper (or any other blends) if you have already pre-salted. Before cooking, pat the meat dry so the surface has the best chance at caramelization. For steaks 1” thick or under, the best method for cooking is in a cast iron pan or directly over flame on the barbeque (see below). You are aiming for even cooking throughout — for example, medium-rare should go all the way to the edges. Steaks cook rather quickly so it is best not to “walk away” while cooking them. Instead, stay with it so you can monitor the heat and also prevent flare ups (grab yourself a drink and chill near the barbeque). It is crucial that you let your steak “rest” after cooking. This ensures the proteins have the opportunity to rebind and the juices evenly re-distribute. Otherwise, if cutting right away, your steak will “bleed out” and you will lose all of those beautiful juices. 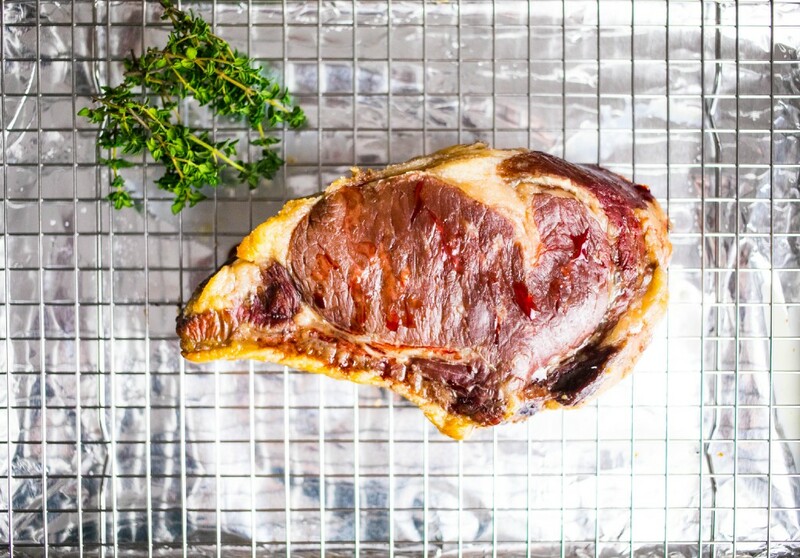 For longer resting times, loosely tent with a piece of aluminum foil to prevent too much heat from escaping — don’t seal the foil or even crimp it, as you don’t want to steam your beautiful piece of meat! There are many ways to cook a perfect steak and people will always debate on which way they think is best. It is all about finding what works best for you! Because these steaks are naturally thin, it works well to cut them into 4 or 5 inch sections for ease in fitting them on the grill or pan, and making for a quick flip. The grill is the best method for this cut, when the coals are nice at hot. Grill on one side for 2–3 minutes, until nicely browned, and then flip and finish off the other side. Remove from the grill and let rest for a couple of minutes before slicing or chopping. These cuts have tough muscle fibers that run through them. You will need to slice against the grain to get the tenderest bite possible. For this thickness, we recommend using a cast iron pan or over direct flame on the barbeque. Rub steak with oil. Season liberally with salt, pepper and other spices (if you haven’t already used the pre-salted method described above). Place on grill, taking care to use an area of the grill not prone to flare ups. A good rule of thumb for the correct temperature is to place the palm of your hand a few inches above the grill. If you can last just up to 3 seconds before needing to remove, the coals are perfect temperature. If you can hang out with your hand over the grill, definitely add more coals! You want to cook over grey coals. Do not spread the coals until they are covered with grey ash or they will lead to uneven heat and undesirable taste. Use a grill scrub or wire brush to clean grill and a towel soaked with vegetable oil to rub the grill grates before placing your steaks. Cook over medium flame for about 4–5 minutes. Flip and cook another 4–5 minutes until desired doneness. Don’t forget to let it rest. Because of the high temperature of the grill, a longer resting time (up to 10 minutes) under a loose piece of foil is recommended. Expect your steak to continue to cook, as resting evenly distributes the heat as well, often elevating the internal temperature 5–10 degrees! Butter baste technique in the cast iron pan. If you are using a cast iron pan on the stovetop, a 1 inch ribeye, for example, can be started on high heat to sear both sides quickly and then reduce the heat to medium low. Add a nice pat of butter (even 2 Tbsp or more) and aromatics such as rosemary or shallots, and continue to cook the steak, basting it with the hot butter and flipping it sometimes several times until you get to your desired temperature. A medium rare steak should be taken off the heat when the thickest part reads 125–130℉, as it will raise a few degrees to a perfect medium rare while resting. This process from beginning to resting phase should take no longer than 10 minutes. Steaks thicker than 1 inch can be cooked in a pan as well, with the butter basting technique (above), but requires constant attention to baste and flip on medium-low heat to ensure the center is evenly cooked. Otherwise, the edges can easily become well done while the inside is rare. Please allow 10–15 minutes for the steak to be cooked to your desired temperature. Don’t forget to rest it another 5–10 minutes. For years, whether at home, at the restaurant or catering, I always thought the best way to cook a thick steak was to sear very hot both sides until crust forms and then finish in the oven for a few minutes. This method works fine if you want to sear your steaks ahead of time, let them cool completely, and then finish slowly in the oven at a friends house for a dinner party. Unfortunately, the results are often inconsistent, overcooked some places and undercooked in others. On the other hand, if you have a frozen steak, you can get great results right out of the freezer. Put that baby right into a hot skillet to brown both sides and then transfer to a 275℉ oven for 15–25 min depending on the size. This method works because the cold internal temperature of the steak allows for slow, even cooking in the oven. Contrarily, if you sear a room temp steak and then pop it in the oven, the exterior of steak is much more likely to overcook. The two methods below may take a little more time and care, but always deliver perfect results — worth it, don’t you think?! Both of these methods rely on slow cooking so the meat reaches an even doneness throughout and then a quick sear on the stovetop over high heat to give a nice caramelized outer surface. For best results, rest the steak 10–15 min after the oven or sous vide before searing. If you sear while the steak is still hot, it is much more likely to overcook. Note: A meat thermometer is necessary for the reverse sear method. Preheat oven to 225 ℉. Liberally season your meat. Place on wire rack in center of oven. Set your oven timer to 30 minutes. At 30 minutes, using a meat thermometer, test the internal temperature of the steak. Keep a close eye, as your steak will be “done” when it is approximately 15 degrees below what you want to end up with (i.e. for medium rare of 130℉, remove the meat at around 115℉). Because of varying oven types and temperaments, the cooking time is not exact. Remove the meat from the oven and set it aside to rest as you heat your pan for the final sear. Because you have essentially “dried out” the surface of the meat in the oven, it is perfectly ready to sear, as moisture is the enemy of browning. Place a cast iron pan over high heat and swirl a little cooking oil in the pan. As soon as the oil begins to smoke, place your steak in the pan. It will crackle and pop, and in a minute or less, get browned. Turn it over and brown the other side. With a pair of tongs, turn it onto its fat edge and caramelize the fat. Remove from heat and let rest just 1 or 2 minutes. Because of the low temperature of the cooking process, steaks done using this method do not need to rest for that long. Sous vide is the easiest and most efficient way to cook a steak. Vacuum seal your steak with seasonings and aromatics and put into a water bath at a temperature approximately 5 degrees below the desired end temperature of your steak. Cook for 1–2 hours; the timing does not need to be as precise because you are cooking at such a low temperature. When it is done, remove the steak from the water and remove from the plastic package. Let rest for 15 minutes while you get the pan ready for the sear. Because your steak has been sealed in a bag, you will want to pat the surface with paper towels to dry it off before proceeding with the “searing” step described above. My favorite sous vide tool is the Joule by Chefsteps but there are many great circulators out there! Steak Guide was originally published in Spice Tribe on Medium, where people are continuing the conversation by highlighting and responding to this story.